I couldn’t do a series of Christmas makeup looks without have a green and red look. Of course if you want to incorporate those two colors, you want to keep it subtle so that it’s not too overdone. So, I went with a touch of green by lining my lids with a green, liqui-pencil liner in ‘Paradis’, instead of going all out with a lid covered in green eye shadow. I then had to add a bold red lip- I thought the color, ‘Le Vermillon‘ by Lancome, was the perfect Christmas red! To glam up this simple, but bold, look, I added some voluminous false lashes by Velour Lashes. These are from their Fluff’n Thick collection and are called Fluff’n Whispie. However, you can just through on some mascara on your lashes if you are more comfortable with that! To see how to get this Christmas Makeup look, just watch the video below! 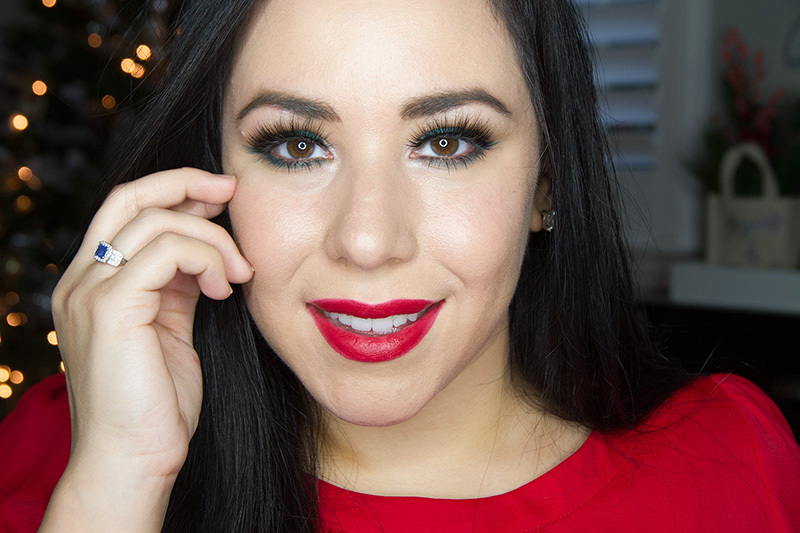 You can watch my Christmas Eye Makeup look here.